Foundations of Mathematics. 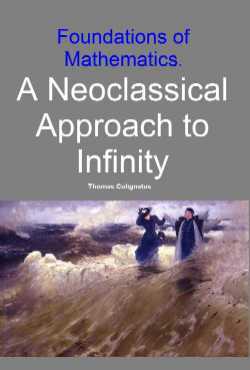 A Neoclassical Approach to Infinity (FMNAI) is for (1) students interested in methodology and the foundations of mathematics – e.g. studying physics, engineering, economics, psychology, thus a broad group who use mathematics – and (2) teachers of mathematics who are sympathetic to the idea of bringing set theory and number theory into mathematics education. (A) Constructivism with Abstraction, as a methodology of science. (B) Particulars about infinity and number theory, within foundations and set theory. (C) Correction of errors within mathematics on (B), caused by neglect of (A). Other readers are (3) research mathematicians, who would benefit from last correction, but who must mend for that they are not in the prime target groups. (i) They greatly enhance competence and confidence. (ii) They open up the mind to logical structure and calculation also in other subjects. (iii) They are fundamental for learning and teaching themselves. The axiomatic system for set theory ZFC is shown to be inconsistent. Mathematics has been in error since Cantor 1874 because of neglecting above methodology of science. Warning: This book proves radical new ideas and must be read with care. If you spend more than a cursory glance on this summary then it is advisable to get the hardcopy and continue reading from paper. I tend to focus my research on misconceptions that lead society away from common sense, and then I select pivots that cause crucially different points of view depending on how the argument is resolved. Such a pivot only works well if the argumentation gets proper attention.